Usually associated with Fine Wines, Tourism and Mining, there is much more that lurks beneath the day to day activity of the Hunter Region than meets the eye. Tales of Murder, Suicide, Convict floggings, Public executions, Bushrangers, and cruel Landowners abound. Find out how people lived worked and died in an age of mortality and hardship. And if you are lucky you may meet one of our resident ghosts? Owner and operator Murray Byfield's genealogy extends right back into Hunter's River history to convict Robert Byfield (Cassilis) and John Swan of Lemon Grove (Paterson Plains). He has been an active Paranormal Investigator for over ten years and is a local history buff. 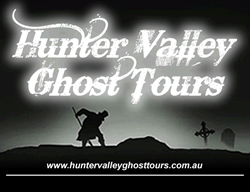 Visit www.huntervalleyghosttours.com.au for more information.